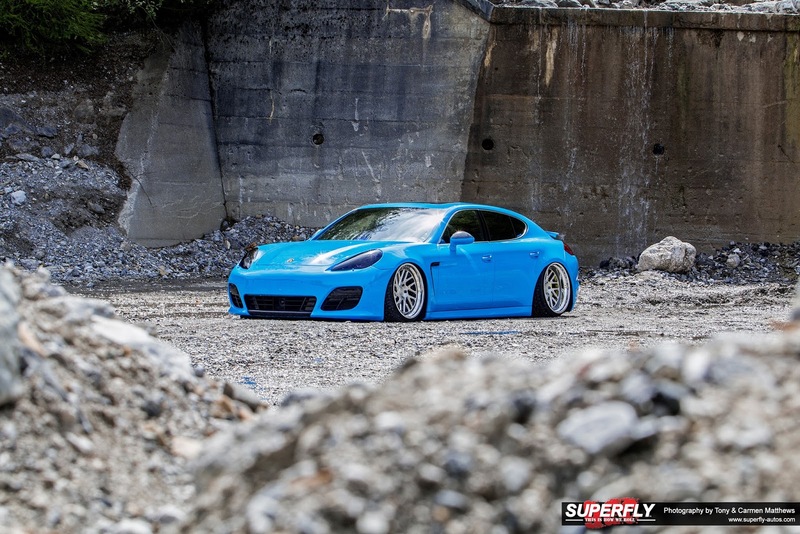 COULD THIS INSANELY BLUE PORSCHE PANAMERA BE BRINGING BACK THE LONG LOST ART OF EXTREME CUSTOM? OMG!!! Were the words that escaped my mouth when I saw this incredible extreme custom Porsche at this year’s Worthersee car meet in Austria. Did I just go back in time as we made the road trip from Germany? Or was there something in my coffee this morning? Well, it turned out that my eyes didn’t deceive me and what I was looking at was a full-blown custom car, which we had not seen since way back to 2007! Firstly, the car choice…A Porsche Panamera! How brave? Secondly that combination of that super bright blue paint with carbon touches and then the hard slam on air ride. Yes it is slammed to the ground with air ride, which some may argue that it’s ‘Stance’, but in my eyes this is a combination of the two. Something that I use to see over 6 years ago, when wild paint colors, slams and extreme bodywork were all the rage. Would the VW enthusiasts at Worthersee see this as a ‘Ricer’? The now overused word on the scene, when it comes to custom cars? To my surprise, this incredible creation got everyone’s attention, but in a huge positive way! For that we were glad to see, as this car is no Ricer at all, as the execution of the bodywork, finish and overall effect takes this car to the extreme and done at the highest level of craftsmanship and downright creativity. So who is the owner that is brave enough to go against the ‘Stance’ craze and pull it off in SuperFly style? His name is Marcus Prösch who is the owner of Dumped, who specialize in supplying H&R air ride suspension kits. Before purchasing the Panamera, he was heavily into Volkswagen’s, especially of the Golf variety and he originally wanted to build a wide body Audi R8 with the now famous Liberty Walk body kit. However, he got the chance to drive a Panamera and that was it. He was sold on creating a custom Panamera like no other, which would represent his automotive business. He purchased the Panamera back in October of 2014, where thanks to a chance meeting with his friend Mario from Rad48 Wheels at Worthersee, is where the two along with David Frohlich from Form And Function, set about masterminding the project. As a trio, these three guys have pulled off some of Worthersee’s most inspiring projects and you can see Mario’s killer Caymen in this very issue. So that color, is it available? Nope, this is a very special mixture that was inspired by earlier Porsches in the 1970’s, so it makes for one special color and that X Factor of his project. For me, it’s so fresh to see bright colors making their way through the subtle blacks, greys and browns of late. It took from October last year up until one week before Worthersee to have it complete, thanks to the amazing craftmanship that David Frohlich at Form And Function pulled off. Apart from the paint, the only bodywork customisations were the added carbon touches such as the door mirrors, rear spoiler and side vents. The choice of wheels was simple for Marcus, with the Messer brand being his weapon of choice, wrapped in Falken Tire rubber. Some wheel arch work had to be performed to ensure there fitment, especially with the air ride suspension supplied by HP DriveTech and AccuAir Suspension. The Panamera now sits perfectly on the ground when fully dropped and the wheels don’t catch in the arches. A job well done in my books! So where did the inspiration for the project come from I asked Marcus? There are no major influences, just that we spend a lot of time around cars and get a flavour for ideas all the time. For me, Marcus and the guys have done a brilliant job and pulled off a custom that is refreshing to see and that creativity is still out there.